The digital payment provider saw continued strength across its business, which powered solid gains for shareholders. 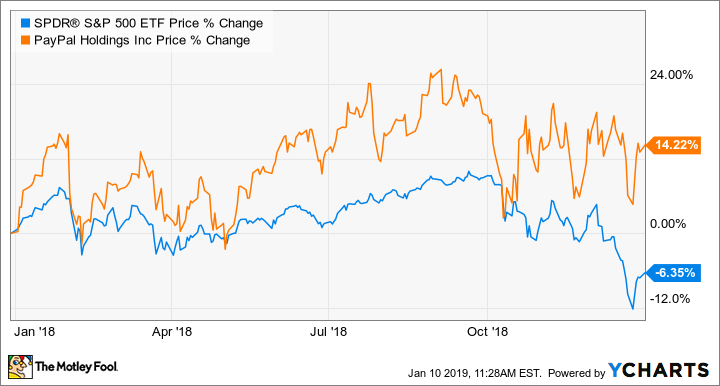 It was a busy year for PayPal Holdings (NASDAQ:PYPL). The company continued to report robust operating results, made a few acquisitions, and continued to form partnerships to expand its brand ubiquity around the world. The stock jumped around toward the end of the year amid the turbulence in the broader market, but steady growth in revenue and earnings powered a 14.2% increase in the shares last year, according to data provided by S&P Global Market Intelligence. Through the first three quarters of 2018, PayPal grew revenue 20% year over year to $11.2 billion compared to $9.35 billion in 2017. The growth in operating income was even stronger, at 24.3% year over year. Those results were fueled by increases in total payment volume, new customer accounts, and customer engagement. The results reflect the efforts management has made over the last few years to form partnerships with banks, credit-card companies, and other digital wallet providers to provide customers with more payment choices at checkout. PayPal has now gained a position of being a go-to partner for retailers, as well. For example, Walmart recently reached a deal with PayPal to make the payment provider's services accessible in all of the retailer's stores domestically. It appears that nothing will stop PayPal at this point. The company is staying on offense, as evidenced by the acquisitions management made last year that could expand PayPal’s addressable market. The most notable one was the purchase of iZettle for $2.2 billion. iZettle is essentially the Square of 11 international markets, including Latin America, which represents a tremendous growth opportunity for PayPal. Analysts expect PayPal to grow earnings about 20% per year over the next five years, which is consistent with the company's recent growth. The shares are not cheap, at a forward earnings multiple of 30 times next year's earnings estimates. Given the opportunities ahead and PayPal's current momentum, I wouldn't be shy to be a buyer at these prices. Check out the latest PayPal earnings call transcript.